Posted on October 10, 2016 at 10:38 am. Win $50,000 in cash prizes this month on live roulette at Leo Vegas Casino just by playing live dealer roulette. Take a seat at your preferred live roulette table by Net Entertainment, out of Fiesta Live Roulette, Starburst Live Roulette, and Circus Live Roulette to score cash prizes, free spins and free bets. The tables are open from 2pm to 2am AEST, so be sure to have your online casino account active by signing up here. You will find these tables available via the NetEnt live gaming lobby when they open with the following incredible offers, up until October 29. 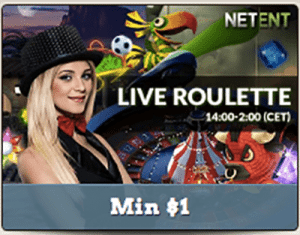 This table combines live dealer roulette with NetEnt’s popular pokie Spiñata Grande – and if you place your bets here you can win a share of $50,000. All you have to do is play 10 rounds at the Fiesta Live Roulette table to score a ticket entry into the random cash draw. Starburst is one of NetEnt’s most popular pokies and now the software provider is offering the chance to win on the title via live roulette. You will be credited with your free spins at 2pm the following day. To inject a little more entertainment into their live dealer catalogue, Net Entertainment have introduced tables which feature unique backgrounds. This includes changing the background to a circus tent for their Circus Live Roulette title. If you want to join the roulette circus and earn cash, simply play 20 rounds at the Circus Live Roulette table each weekend to receive $5 in cash. Your $5 cash will be awarded to you at 2pm the following day with a maximum of $20 available to be won per player, over the promotional period. What’s more, you can play these titles on desktop, laptop, tablet or smartphone and win. You do need to be a member of Leo Vegas and have money in your account to play at these tables, so sign up and make a deposit to participate in these incredible offers running this month.